First discovered Chokola years back at Khan Market. One of the best chocolate makers in Delhi NCR – The Dark Hot chocolate drink (70% cocoa) is the best I have had in Delhi so far. 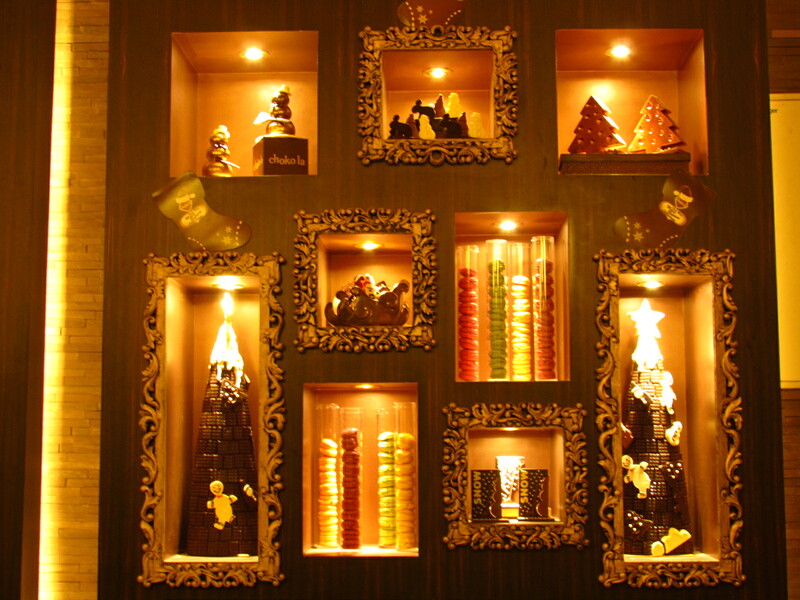 There is a take away counter like Cake shops, a chocolate counter like the lindt showrooms & also an eatery. What’s unique about food in Choko La is that they serve very good vegetarian versions of food from different parts of the World…… in addition to being one of the best chocolate related food makers in Delhi NCR. Was delighted to find that the opened a branch in Galleria Gurgaon. I still have a feeling that the Khan market one is better – the rest are Franchisee run. In two visits we managed to try some Excellent subtle scrambled eggs, A very good Vegetarian version of Eggs Benedict, Superb layered Croissant, One of the best Lemon Tarts in town, Cool chocolate mousse, one of the best in town Baked nachos with Guacamole , salsa & cheese, a curious Curried coconut & carrot soup, a very average Black Forest cake & a finger licking good peanut butter cupcake. Day 1 at gurgaon : Had Scrambled eggs with wild mushrooms – Subtle, Soft & juicy scrambled eggs with the cheese thoroughly mixedwith the egg & topped with a hardened thin layer of cheese. Better than most of the 5 stars I have had this in. We had a plain butter croissant – flaky, layery, crunchy on the top, soft within……. outstanding. Then we had our favourite – Eggs Benedict with hollondaise sauce – For the uninitiated, it’s a layer of crispy round bread at the bottom, topped with a layer of ham (ham not served in Choko La) & atop that is a semi solid egg – All of these are baked together in a cup & served with hollondaise sauce (creamy buttery, flavorful) & capers. There are 2 versions. We chose the one with spinach. I wud say this dish was excellent & a true example of how good taste can b acheived even wothout using nonvegetarian ingredients. 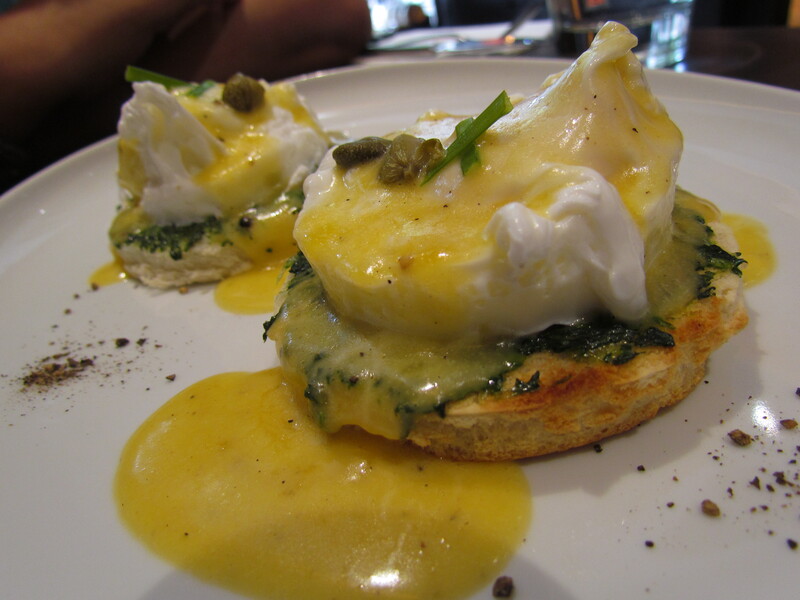 The flavors of spinach were intact, the bread was crispy , capers added spice, the eggs were perfectly done & the sauce atop was too good. Super liked it. What followed was a lemon tart & a chocolate mousse – lemon tart was not too lemony, not to sweet – subtle, to the point & just perfect. The tart was flaky & super cool too. Chocolate mousse was dark, rich and yum. 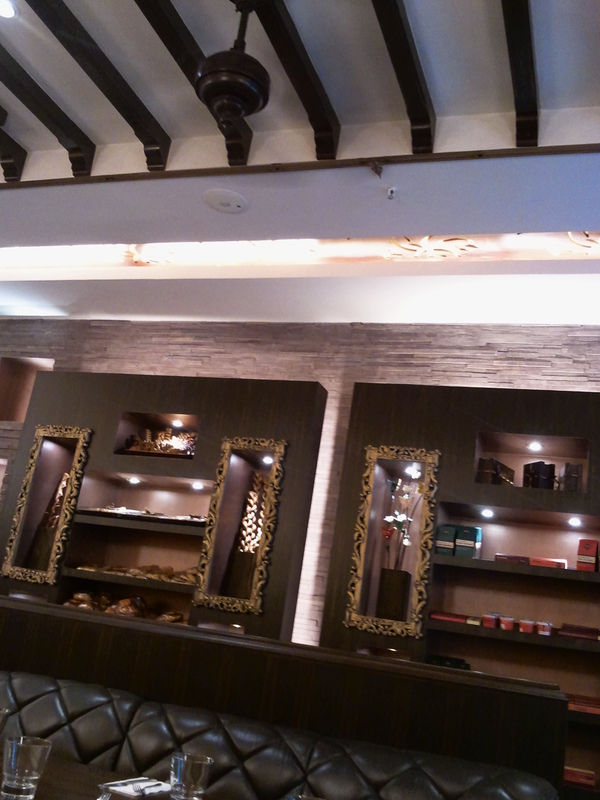 ‘A big disappointment was that they do not serve their signature drink – 70% cocoa dark hot chocolate in Gurgaon. It’s like VW showroom not selling a beetle or apple showroom not selling an ipod!!!!! 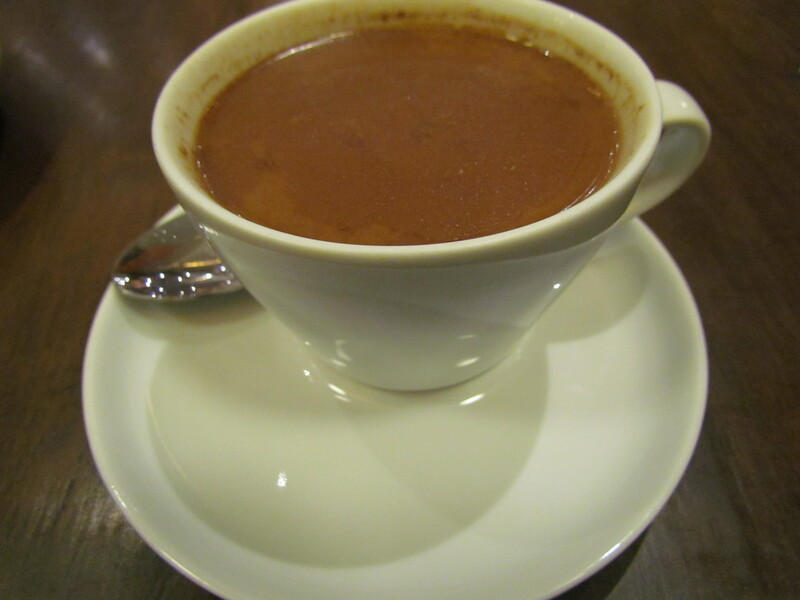 Urge the manager/owner to come out of his cocoon (of whatever practical issues he might have) & serve the signature drink…..The one served in Khan Market is the best hot chocolate in NCR.‘ was what I wrote at the time of publishing this post. Revisited 18th Dec 2011 & we were pleasantly surprised to find that this drink is now available at Galleria too. Saothome chocolate that is served in Khan Market is not served in Gurgaon as well!!!! Day 2: Tried Baked nachos with Guacamole , salsa & cheese. For beginners to this cuisine, Guacamole is a dip made from avocados. The best part was the nachos – they said these were made by them – crunchy, crispy, full of strong flavors & superb in taste , salsa was freshly made – not bottled & the Guacamole was cool. Overall it was one of the best (not the best) nachos we had in town. Post this we ordered, simply out of curiosity, ‘Curried coconut & carrot soup‘. Let me tell u – Neither Murugan will be able to trace coconut not a rabbit will b able to smell carrot in this!!!!! It was a fairly thick yellow soup but was tasty inspite of the parentage being cloudy. ‘For dessert we had a peanut butter cupcake – rich dark chocolate cup cake with a cuddled up bunch of roasted peanuts in the middle base, topped with a rich creamy thick layer of yumm peanut butter (not that i am a fan of peanut butter but this was real goood) + few sticks of flat milk chocolates – marvellous, outstanding, phenomenal……..blah blah blah… ‘ was what I wrote when I first published this post. Revisited the place & found the same cupcake to b slightly suboptimal – the base of the cake had hardened a bit due to full day refrigeration. Last time we had it wasa morning. The other dessert was very dissappointing – ‘layered blackforest‘ – very ordinary , very average, nowhere near to what a good European Black Forest is. 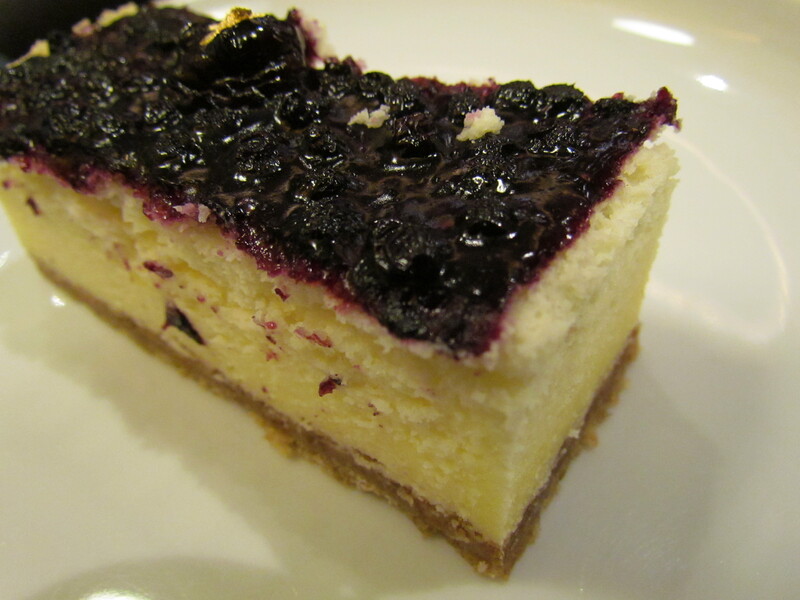 The blue berry cheesecake was not as soft as a cheesecake shud be – once again a result of full day refrigeration. I guess the guys have to do something about it. The taste (minus the texture) was excellent though. U can try it out. Service is perfect & the guys really take care. Superb ambience with an old world feel to it. Had a good Cinnamon coffee. 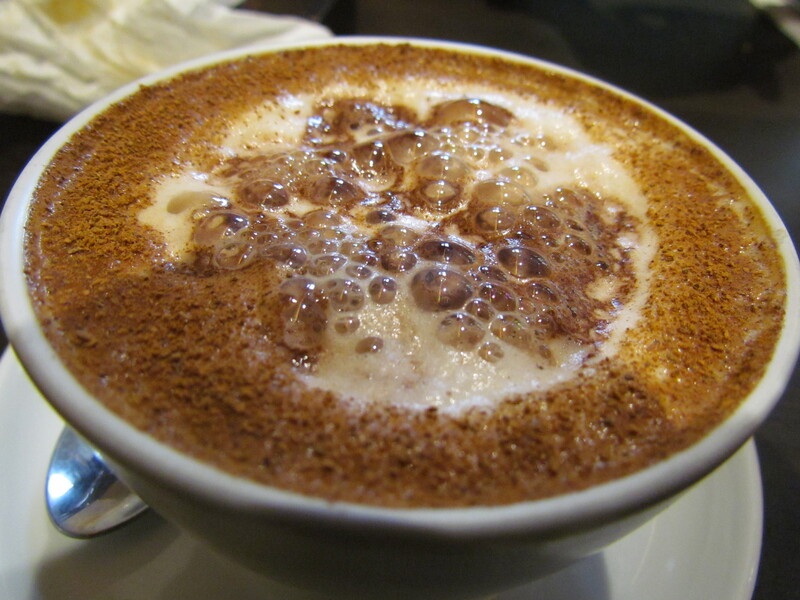 Powdered cinnamon atop some good coffee. Liked it. 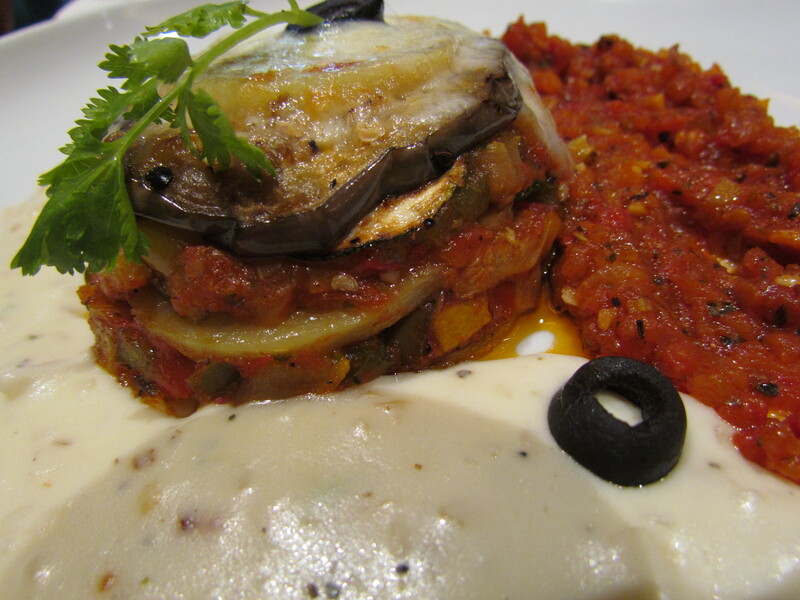 We started off with vegetarian Moussaka – It turned out to be layers of brinjal (egg plant / aubergine), potatoes & Zucchini baked together with cheese. This was served with a white cheese sauce & a freshly made tomato sauce. At no point in time during the meal, I (a harcore carnivore) felt that I was eating a vegetarian dish – I just felt I was having a very good dish. 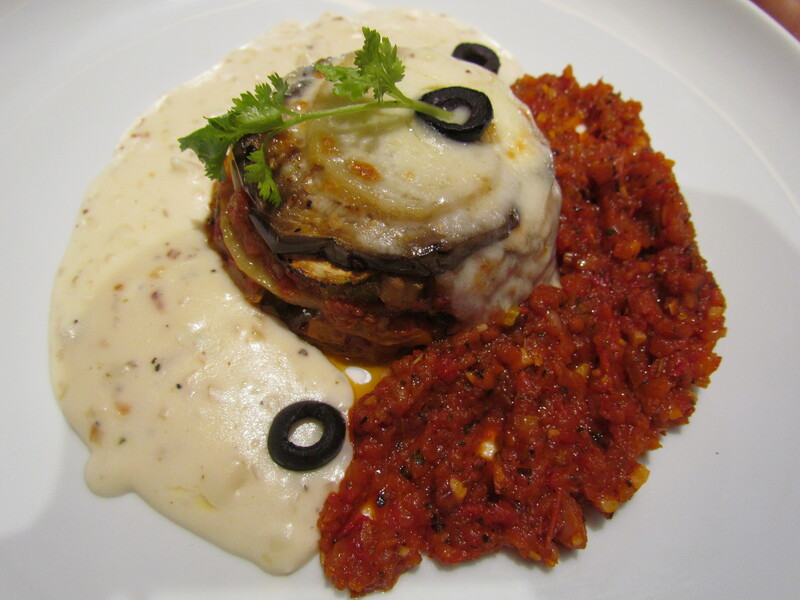 This is inspite of the fact that the aubergine used for preparing the dish had too much seeds. 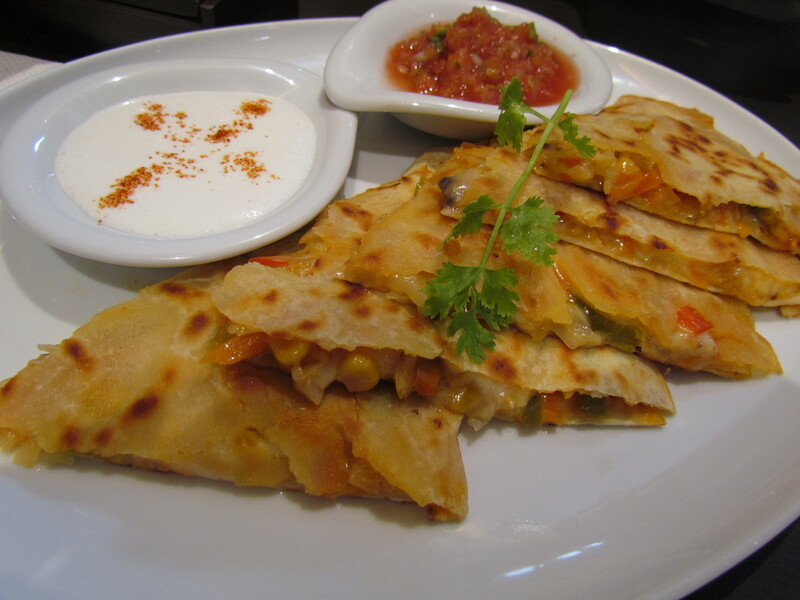 Then we had the Vegetarian Quesadillas (Mexican) – perfectly done, mildly crispy layered upper – looked a lot like our stuffed parathas (though different) , veggies including American Sweet Corn & cheese within. This was served with an outstanding (in-house made) Salsa – The best I have had in India so far. Almost as good as the ‘real thing’ served in the Tex Mex Restaurants in USA. The white sauce was mild & too good as well. Wow! superb. 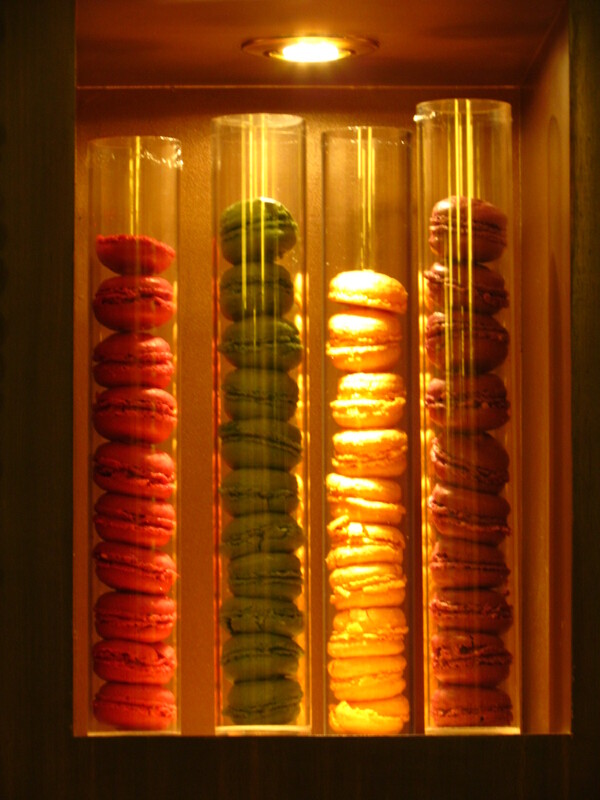 would try to visit this place next time I happen to visit Delhi. 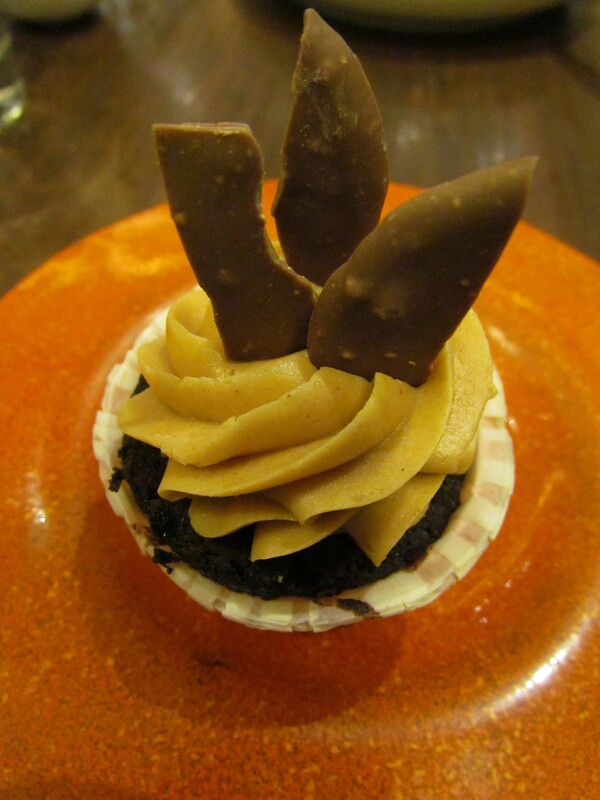 You seem to be a regular visitor to Kolkata and a foodie so you must have visited Flurry’s. After reading this, I was wondering if you have any post on Flurry’s Kolkata. No, actually I have not covered Flurry’s. Will do it sometime. That was a very refreshing description that I read on a Saturday morning. 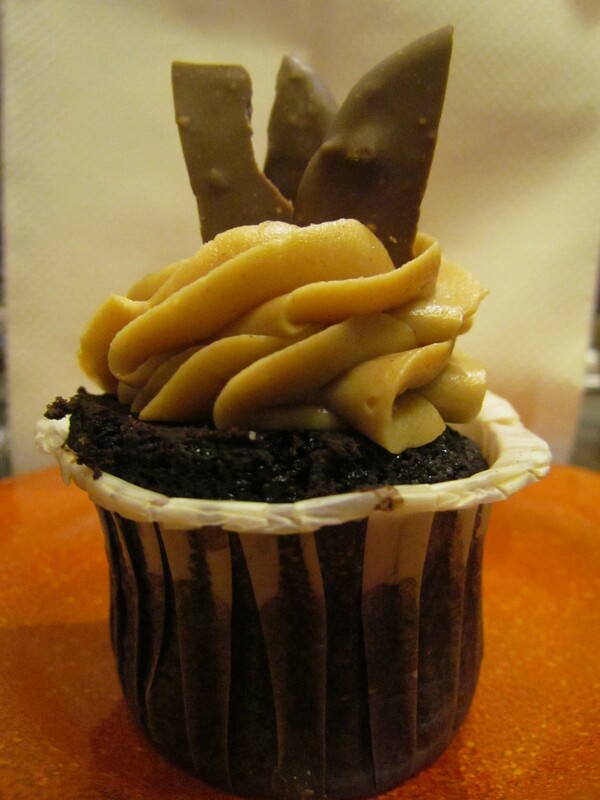 The peanut butter cupcake looks delicious, as does everything else!